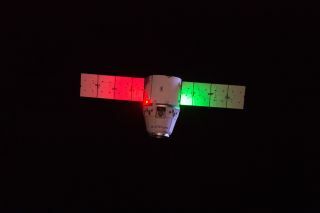 SpaceX's Dragon spacecraft will depart the International Space Station July 2, bringing more than 4,100 lbs. of cargo back to Earth. UPDATED 7/1 8:52 p.m. EDT: Due to weather conditions in the Pacific Ocean splashdown zone, the Dragon spacecraft's release will be delayed until Monday, July 3 at 2:28 a.m. EDT (0628 GMT). On Monday (July 3), the crew of the International Space Station will bid farewell to a Dragon cargo spacecraft, which will head back to Earth with more than 4,100 lbs. (1,900 kilograms) of returning cargo in tow. It's this specific spacecraft's second splashdown: It brought cargo to the space station and safely returned to Earth in 2014 as well. When the cargo craft launched to the space station in June on SpaceX's Falcon 9 spacecraft, it was the first-ever relaunch of a previously used Dragon. Departure coverage will begin at 2 a.m. EDT (0600 GMT), and you can watch it here on Space.com, courtesy of NASA TV. Flight controllers will detach the spacecraft using Canadarm2, the space station's robotic arm, and then NASA astronauts Jack Fischer and Peggy Whitson will command the arm to let go, NASA officials said in a statement. The spacecraft will move away from the space station and then head out of orbit, splashing down in the Pacific Ocean after a 5.5 hour journey. The deorbit burn and splashdown won't be shown on NASA TV. The spacecraft brought close to 6,000 lbs. (2,700 kg) of supplies, equipment and research experiments to the station. Its cargo included the Neutron star Interior Composition ExploreR (NICER) and the experimental Roll-Out Solar Array (ROSA). After ROSA's experiment completed, the array was jettisoned from the space station because the ground team was unable to roll it back up to stow. When Dragon splashes back down, SpaceX personnel will travel two days by sea with the spacecraft to return it to Southern California. From there, the craft's cargo will be shipped back to Houston, NASA officials said in a blog post.